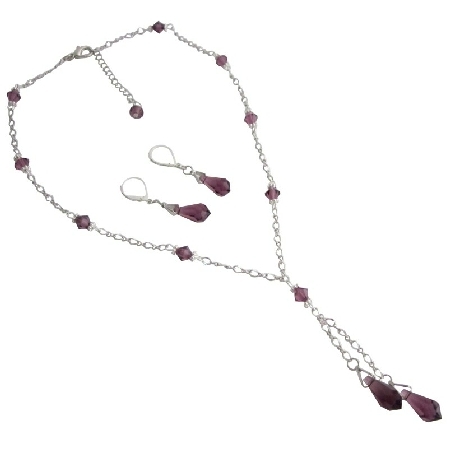 This breathtakingly beautiful necklace & earring set features stunning Y-necklace with two teardrop dangling Swarovski Amethyst Teardrop Pendant (item # 6000 15x7.5mm) with 6mm Amethyst bicone in Silver Chain with teardrop Earrings in genuine 92.5 Sterling Silver lever back the right amount of dazzle. Gift for mother let this amazing Necklace & earring set or your perfect finishing touch. Buy Mother's Gift Christmas Time Amethyst Teardrop Jewelry Set, sold & shipped by Fashion Jewelry For Everyone where you can shop online for Leading Online Retailer for Indian Fashion Jewelry. This Necklace Sets collection has been tagged as Gift Christmas,Gift Jewelry,Christmas Gift,Christmas Jewelry,Amethyst Gift,Amethyst Teardrop,Amethyst Jewelry,Teardrop Jewelry,Jewelry Gift,Jewelry Set,Great,Mother's,Gift,Christmas,Time,Amethyst,T.